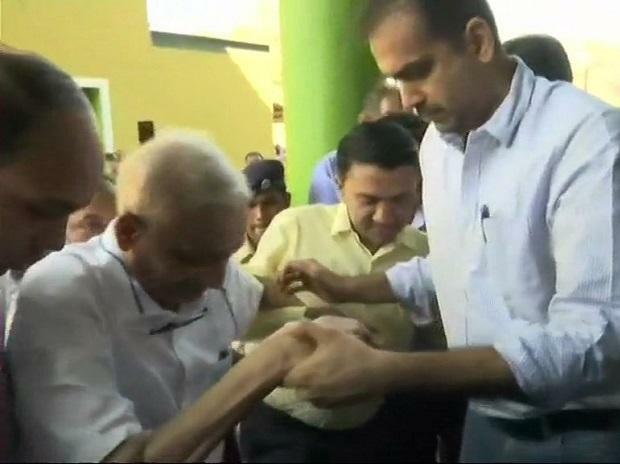 Ailing Goa Chief Minister Manohar Parrikar Tuesday attended his office at the secretariat here for the first time in the last four months, on the New Year Day. Parrikar, 63, has been absent from the office for extended period due to a pancreatic ailment. He had undergone treatment at private hospitals in Mumbai and the USA last year. He had last attended the office in August 2018, before he was shifted to Mumbai for treatment. The chief minister, with medical appendage, got down from his car at the main gate of the secretariat at around 10:45 AM, smiled at people, and walked inside, sources said. Hundreds of BJP workers who had gathered outside the complex cheered when Parrikar arrived. He was formally welcomed by BJP MLAs, including Legislative Assembly Speaker Pramod Sawant, ministers Mauvin Godinho, Milind Naik, Nilesh Cabral and former MLA Kiran Kandolkar. Sources from the Chief Minister's Office (CMO) said Parrikar held a meeting with officials of the Personnel department to review existing vacancies and other issues like promotions and transfers that needed urgent attention. He also met staff of his office, they said. In the first public appearance since his return from the All India Institute of Medical Sciences (AIIMS) in Delhi in October, the chief minister had last month inspected the work on new bridges over the Mandovi and the Zuari rivers near Panaji. He had met Union Civil Aviation Minister Suresh Prabhu last week to discuss various developmental works. He also discussed with the minister the Centre's plan to make Goa an investment destination. Since his discharge from AIIMS, Parrikar has been recuperating at his private residence at Dona Paula near Panaji.